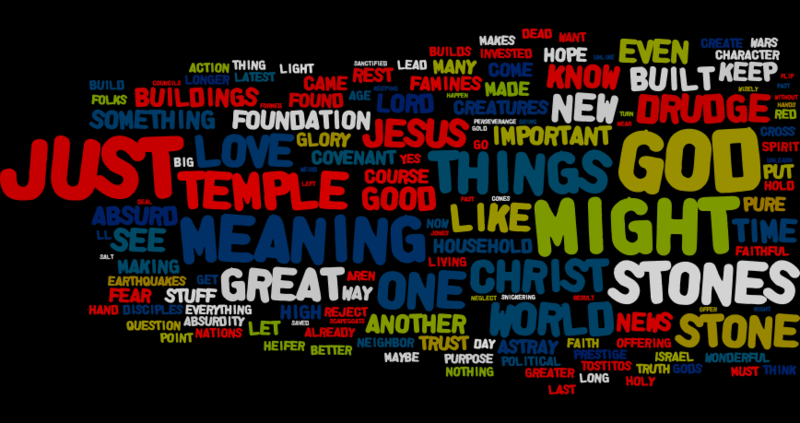 This sermon is a meditation on how and what we assign meaning to. Luther in assigning meaning to the first commandment said whatever we fear, love and trust the most is our God. We all have “wonderful stones”, things we have assigned meaning, things we expect to last, that have or are often in danger of becoming our idols. We trust those stones more than anything else. Jesus’ words to all such stones – even ones that once contained the glory of the living God – is that they must come down. But living based on trust – based on faith in Christ – in the middle of a world that is hostile to such a life is not an easy walk. As our opening hymn, the hymn I left in the recording at the end puts it, “I Walk in Danger all the Way“. The Apocalyptic accounts remind us who has it all in his hands. Yes, we walk in danger all the way, but our walk is also heavenward all the way. And along that walk we have help – like the Angel Michael from the OT lesson. We also have the examples of our Lord and the great cloud of witnesses. The Christian life is not the easy one. It is an examined life for wonderful stones that have become idols. It is assailed by temptations of shelter that are not. But it is a true life. The one who perseveres will be saved.